Now if, as nearly all of science concedes, human beings are largely (if not entirely) the product of evolution, Hayek’s view would seem to be, at the very least, highly probable. In any case, it explains a great deal of what we find in the altruist-humanitarian complex of motivations that animating much of the non-revolutionary left. Combine Hayek’s insight with those of Pareto and Sowell, and we can begin to form a psychopathology of left-wing humanitarianism. This psychopathology provides a far more convincing explanation of the “democratic” forms of socialism, collectivism, and leftist “progressivism” than Rand provides us, with her emphasis on philosophical premises and other will-of-the-wisp abstractions that are too topical to mean anything definite. Rand seems to have sensed the danger that an evolutionary explanation of social attitudes posed to her philosophy, for she created several rather inept strategies to combat it. Her favorite was her rather absurd definition of “instinct.” Rand held that instincts are an unerring and automatic form of knowledge. This is obviously a definition Rand invented for the purposes of debate. No natural scientist has ever defined instinct in that way. Instincts can refer to any unlearned behavior or emotional propensity, whether in animals or human beings. The assumption that human beings don’t have any such instincts, that their minds are “blank slates” at birth, is not supported by science. Nor does the evidence support Rand’s notion that emotions are the product of ideas. Ideas may influence emotions, but they don’t produce them, as anyone familiar with the most basis psychological evidence regarding infants knows. Human beings do in fact have innate tendencies. The strength and intensity of these tendencies may differ between individuals. But the fact of these tendencies soon becomes obvious to anyone who observes human behavior. In some people, these tendencies cause them to wish to see their altruistic instincts writ on society at large. Recall what the good people over altruists.org wrote: “We believe that [altruistic modes of behavior] can represent a more stable, sustainable solution than the money-focused, model of competitive capitalism.” Why do altruists, humanitarians, and other so-called do-gooders believe in such a thing? It is neither a rational nor an evidence-based conviction. All logic and fact point to the inescapable conclusion, as Hayek puts it, that to follow the altruist-socialist path “would destroy much of present humankind and impoverish much of the rest.” So it should be obvious that these altruists, these humanitarians, these socialists (call them what you will: the name’s not important, only the thing in reality that the name represents) are animated by a non-rational source—that is, by (again to quote Hayek) “an atavistic longing after the life of the noble savage”—a life which is, after all, more more gratifying to innate human instincts and tendencies. These instincts and tendencies are not implanted in the minds of men by intellectuals following the pedant of Königsberg. Thousands of years of evolution put them there. Bad arguments against Kant in the manner of Rand will do little to mitigate their pernicious influence. Observe what this beneficiary-criterion of [the altruist] morality does to a man’s life. The first thing he learns is that morality is his enemy: he has nothing to gain from it, he can only lose; self-inflicted loss, self-inflicted pain and the gray, debilitating pall of an incomprehensible duty is all that he can expect. He may hope that others might occasionally sacrifice themselves for his benefit, as he grudgingly sacrifices himself for theirs, but he knows that the relationship will bring mutual resentment, not pleasure-and that, morally, their pursuit of values will be like an exchange of unwanted, unchosen Christmas presents, which neither is morally permitted to buy for himself. Apart from such times as he manages to perform some act of self-sacrifice, he possesses no moral significance: morality takes no cognizance of him and has nothing to say to him for guidance in the crucial issues of his life; it is only his own personal, private, “selfish” life and, as such, it is regarded either as evil or, at best, amoral. In Rand’s analysis, the practical effects of altruism are logically derived from her rather extreme definition of the term (i.e., that altruism means “ man has no right to exist for his own sake”). Since (as I noted in the previous post) few if any humanitarian/altruists would accept Rand’s definition, her analysis is of little value. It tries to determine matters of fact almost exclusively on the basis of logical deductions from principles hardly anyone holds, and which very few ever follow in practice. A more detailed examination of the actual facts will show that the practical effects of altruistic and other so-called “humanitarian” doctrines tend to run along somewhat different lines. If we examine what happens in the real world of fact when humanitarians dominate the ruling class of a society, we discover that the principle danger of humanitarianism arises, not necessarily from the “self-sacrificial” rationalizations expressed in extreme forms of the doctrine, but often from the cowardice of the typical humanitarian. For it would appear that humanitarianism holds a particular appeal to the pusillanimous type of individual. Humanitarian doctrines serve as a kind of cover or fig leaf for cowardice, as if the humanitarian is trying to convince himself and others that he appeases violent criminals and his nation’s most dangerous enemies not out of cowardice, but out of love and pity for mankind. Let us imagine a country where the governing class, A, is inclining more and more in the direction of humanitarianism…. Such a country is on its way to utter ruin. But lo, the subject class, B, revolts against the class A. In fighting A it uses the humanitarian derivations so dear to the A’s, but underlying them are quite different sentiments, and they soon find expression in deeds. The B’s apply force on a far-reaching scale, and not only overthrow the A’s but kill large numbers of them—and, in so doing, to tell the truth, they are performing a useful public service, something like ridding the country of a baneful animal pest…. The country is saved from ruin and is reborn to a new life…. While Pareto might be criticized for seeming a bit too eager to see humanitarians exterminated, this does little to effect his main point. Nor should we let Pareto’s focus on revolutions cause us to think that the cowardice of humanitarians does not pose a threat to the West. In America there is little chance of a violent revolution. But this does not mean that the dominance of humanitarians in America’s ruling elite does not pose a threat to the social order. For external threats still exist and must be faced resolutely. And humanitarianism, even when it doesn’t completely oppose defending the country against its enemies, nevertheless cannot help undermining and demoralizing the will to fight. Now while Objectivists such as Peikoff seem to share Burnham’s disdain of the liberal humanitarian’s squeamishness about using force, Rand’s conviction that all social pathologies stem from abstract “premises” once again darkens rather than enlightening the understanding. Believing that liberal humanitarianism is caused by the acceptance of the premise of altruism (as defined by Rand), Objectivists think they can combat its pernicious effects by demonstrating the absurd and immoral consequences of the premise of extreme self-sacrifice. Unfortunately, humanitarian cowardice is not caused by the premise of self-sacrifice. On the contrary, cowardice, to the extent that it is not innate, is primarily caused by soft living. Cowardice can only be cured, if it can be cured at all, by strenuous discipline and experience in battle. Trying to change it by arguing against it’s so-called premises is silly and a waste of time. It's Still Real To James Valliant, Dammit! Unlike James Valliant, we here at ARCHNblog have not seen the galleys of the new biography of Ayn Rand by Anne Heller (Ayn Rand and the World She Made), but from the early reviews it doesn’t appear that it is going to take the Valliant/Peikoff line that Rand’s one character flaw was her occasional anger. In fact, it seems that Ms. Heller’s portrayal of Rand will confirm the accounts of Nathaniel and Barbara Branden. Mr. Valliant’s opus has now joined the ranks of the Hitler Diaries, I Rigoberta Menchu and the Sokal Hoax in the annals of journalistic and literary embarrassments. This, combined with the growing scandal of the tampering at the Ayn Rand Archives, which another recent Rand biographer Jennifer Burns has revealed (here, and here for the story so far), and Valliant's own dubious adventures in tampering with the Wikipedia, his Peikoff-endorsed tome is looking like the crank apparatchik fantasia that we always said it was. Heller shows how frequently Rand lied, explicitly and implicitly, directly and indirectly, to others and to herself. Do we all lie? Sure. But your lie about the artistic ability of your friend’s 6-year-old is nothing like the lies that Rand communicated and believed. She made a profession out of lying to herself about the artistic and intellectual incapacity of 99% of the literary world, so she could feel at home in her own, increasingly isolated domain. And, as Heller’s work shows, there were many worse lies, and worse failures, than literary ones. Rand’s injustice and ingratitude, her intransigent emotional demands, her gross one-sidedness on countless emotional and intellectual occasions, appear in larger dimensions than ever before. All of it testifies to her desire to create the world she wanted to have, even when the evidence was all against her, even when she had to lie to herself and everyone else in order to do so. -Stephen Cox, Liberty Magazine, October 2009. Valliant tried to present the Brandens as vicious attackers of Rand, seeking to distort facts in order to ruin her reputation. But, Heller’s biography, which I have read, doesn’t contradict the Brandens on any major statement of fact. I just finished reading Atlas Shrugged and I couldn't help but notice something. Rand speaks out against altruism and uses various people in the book to represent them. The thing is, through Galt's speech and various revelations in the story, it seems as if these people never even legitimately cared for anyone else…. The characters in her story ... just seem like a bunch of vindictive parasites rather than the common definition of an altruist…. Granted, people like this do exist in the world, but they aren't really altruists. Now there is no reason not to believe that at least some altruists (in the sense of the word provided by altruists.org) are more sincere than not. At least some of these people genuinely wish to do good to others. As Pareto noted, “The intent of sincere humanitarians is to do good to society, just as the intent of the child who kills a bird by too much fondling is to do good to the bird.” Yet despite the best intentions in the world, the altruist, the humanitarian often does more harm than good. How are we to explain this? We know how Rand explains this. She merely defines altruism in the most extreme way (i.e., “ man has no right to exist for his own sake”), and then attempts to draw the necessary conclusions from her definition. But since few, if any, altruists would actually accept Rand’s definition, her explanation of why altruism/humanitarism often harms the very people it sets out to help seems implausible. Altruists say they wish to help people. Why isn’t it possible for them to succeed in this aim? After all, one can certainly imagine an individual who, in his desire to help others, applies intelligence and the lessons of experience to the task and manages to attain his end. Yet so often we find the altruist, the humanitarian failing miserably to achieve his stated goal. 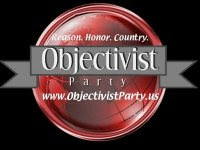 The Objectivist Party vs "Toxic Randroid Cultists"
The Objectivist Party is an interesting recent development (official website here). Founded in 2008 on February 2 (Ayn Rand's birthday) by lawyer Dr Tom Stevens (who sounds like an interesting fellow) The Objectivist Party is a would-be political force not only unaffiliated with the main players in Objectivism such as the Ayn Rand Institute or their arch enemies The Atlas Society, but, judging by the quote above, apparently openly rejecting them (Stevens' quote above is surely aimed at the ARI at least). Typically, the party seems heavy on principle but light on policy. And how The Objectivist Party's interpretation of Randian doctrine actually differs from the "Toxic Randroid Cultists" version is not immediately clear - in fact, it is hard to see how anyone can avoid the deep-rooted cultic incitements built into Objectivism by its founder without ending up avoiding Objectivism itself. But perhaps The Objectivist Party's USP will emerge over time. You can follow Dr Tom Stevens' blog here. Politics of Human Nature 8: Asceticism. At one point in his Mind and Society, Pareto notes that the “principles from which the humanitarian doctrine is logically derived … express in objective form a subjective sentiment of asceticism.” And indeed, for Pareto, asceticism constitutes another important aspect in the humanitarian sickness which afflicts many individuals in modern society. But what, precisely, is this asceticism? Is it a theory or premises, as it is according to Objectivism, that has been absorbed into an individual’s subconscious, where it wreaks havoc on the individual’s "psycho-epistemology"? No, it’s nothing of the sort. Pareto describes asceticism as “sentiments that prompt the human being to seek sufferings or abstain from pleasures without design of personal advantage, to go counter to the instinct that impels living creatures to seek pleasurable things and avoid painful things.” Does this asceticism arise, as implied in Objectivism, from accepting the premise of altruism and self-sacrifice? Again no. Pareto regards asceticism as an offshoot of the residues of sociality. Acts of asceticism are quite largely acts originating in residues related to living in society that continue functioning when they have ceased to have any utility and acquire an intensity which carries them beyond the point where they might be useful. The residue of asceticism must, in other words, be classified with residues of sociality, and frequently represents a hypertrophy of sentiments of sociality…. All [the] varieties of asceticism, when exacerbated by their [derivations], and when efforts are made to enforce them upon others, are the source of huge amounts of suffering that have afflicted, and continue to afflict, the human race. The fact that people tolerate such suffering, and sometimes even accept them voluntarily instead of rejecting them and stamping on those who promote them as on poisonous snakes, shows conclusively how powerful the sentiments corresponding to them are. Really they are perversions of the instinct of sociality, and without that instinct human society could not exist. Now while an Objectivist can at least agree with Pareto’s negative assessment of these sentiments of asceticism, Pareto’s attitude toward their existence is very different from that of Rand and the partisans of her philosophy. Pareto sees these sentiments as part of a certain type of human nature. Most people have sentiments of sociality. Such sentiments are necessary to the social order. But unfortunately, in some people, these sentiments are perverted. Even worse, in many other individuals, there exists a kind of sympathy for such sentiments, so that instead of rigorously opposing the baneful practices that arise as a consequence of this asceticism, people tolerate them, sometimes even praise them. Since all of this is rooted in sentiment, rather than in theory, it cannot be eradicated by arguing with it. Indeed, like stupidity and mendacity, asceticism, along with sympathy for ascetic practices, has existed throughout human history and probably will always exist. It’s simply part of the human condition; and while sensible people will fight it the best they can, it would be foolish to believe that much progress can ever be made against this congenital disease of human psycho-pathology. Now there may be some congenital optimists out there who are under the illusion that, because the ascetic practices of the pre-modern times have long ago disappeared in the West, that there actually has been progress against this sentiment. This is, however, a very superficial way of regarding the issue. The old practices of asceticism, it is true, have, thankfully, disappeared. But they have given way to new practices which, although not nearly as intense, are in some respects worse. The Christian ascetics were primarily inner-directed. They voluntarily chose to whip themselves or reside for years on the summits of pillars or engage in other equally senseless practices. Modern ascetics tend to be far more outer-directed. They wish to inflict their urge for self-sacrifice on others. This we see quite clearly, for example, in the countless follies of radical environmentalism, particularly in relation to the global warming hysteria, which is being used by our modern ascetics as a pretext for forcing pointless sacrifices on the leading nations of the West. One can hardly imagine a more silly, stupid, and senseless piece of legislation than Obama’s cap and trade plan. It would be much better for society if, instead of trying to pass such legislation, our modern ascetics, like the ascetics of old, preferred self-flagellation and years on top of columns.